One of the biggest music festivals of the year in Lyon, Nuits Sonores will last two more days (and nights) in 2018. That’s good news for the 140 000 plus music fans who attended concerts and happy hours events in 2017, a record high. Organizers have already announced the presence of Kamasi Washington on May 8. The American jazz star will hold a 3-hour concert at the Auditorium of Lyon. For the first time, the daytime program will expand from three to four days. Jennifer Cardini will oversee La Sucrière on Tuesday, May 8th, followed by Daniel Avery on the 10th, Four Tet on the 11th and Paula Temple on the 12th. International names include American Action Bronson, England’s Pearson Sounds and James Holden and the Animal Spirits, and Germany’s Young Wolf among many others. Local Lyon artists will also be featured, such as Trypheme and Voilaaa Soundsystem. Discover the full NS days line-up here. After having paid tribute to Warsaw, Brussels, Tokyo, New-York and Lisbon, this year Nuits sonores is honoring Amsterdam. Artists from the Dutch city will perform from Tuesday 8 to Thursday 10 (3pm to 9pm) at Centre Nautique Tony Bertrand (public swimming pool) where the Nuits Sonores festival started in 2003. 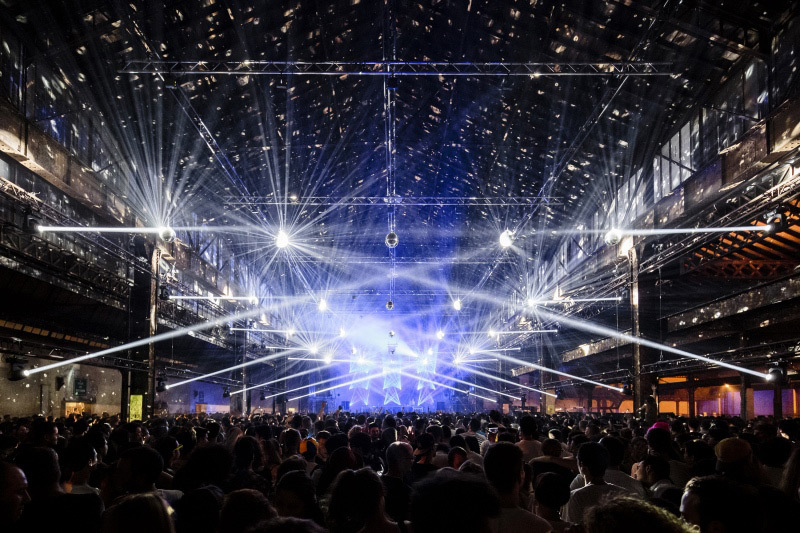 This year, the traditional Nuits sonores Closing Party will become Closing Day, spreading to include Le Sucre and La Sucrière’s Salle 1930 and Esplanade. It runs from 3 p.m. to 10 p.m., and tickets are available to pass-holders until March 11. This visual identity of this year’s festival is a combination of four patterned shapes overlapped in different ways to fit the space of the page, poster, or program on which they appear. It was created by Julian Montague, an artist, graphic designer and photographer from Buffalo, New York. He is known for his conceptual designs and Instagram account featuring modernist book covers. His Nuits sonores design represents sound waves and the people interacting with the music and each other. Nuits Sonores Festival– May 6-13.